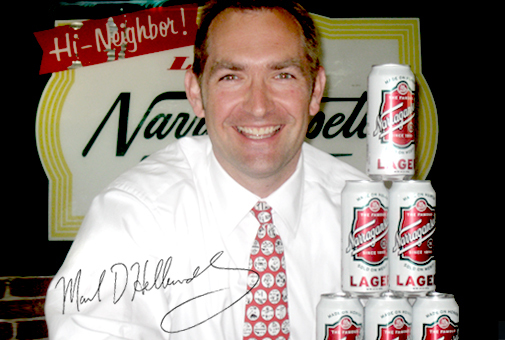 Brewbound is delighted to announce that Mark Hellendrung, the president and CEO of Narragansett Beer Company, will present at the upcoming Brewbound Session, which will be held on May 29 in Boston. Drawing from over 20 years of experience in the beverage industry — which included stints with Nantucket Nectars, where he was president, and Magic Hat, where he coached the sales and marketing teams — Hellendrung will discuss the elements for fostering an emotional connection through branding. As part of his presentation, Hellendrung will share key insights on how to develop a successful brand story and offer ways in which craft brewers can convey their point of differentiation to wholesalers, retailers and consumers. Using Nantucket Nectars and Narragansett as case studies, Hellendrung will discuss how both companies have taken unique brand ideas and turned them into successful businesses. Attendees will also have the ability to take part in a Q&A session following Hellendrung’s presentation. The Brewbound Session, which will take place on May 29 at the Revere Hotel in downtown Boston, is a full-day conference for beer industry professionals. The event focuses on the strategic marketing, brand building and business development issues that most directly impact craft brewers. A variety of distribution, retail, investment and branding discussions are offered. Brewbound Session attendees will have multiple opportunities to engage speakers, both during the moderated portions of the program and also during structured networking and sampling breaks. Sponsorship and exhibiting opportunities are available. To learn more or for questions regarding registration, please contact Mike Vassallo at mvassallo@bevnet.com or by phone at 617-231-8827 to learn more.